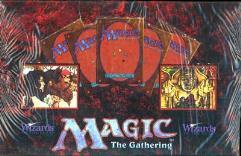 This Retired sealed box of Magic the Gathering 4th Edition boosters contains 36 packs with 15 cards in each pack. 4th Edition is one of the oldest sets, made in 1995, a fan favorite that once again unearths many of the key cards from MTG's glorious history over the first 2 years. To suggest but a few of the significant cards from this 378 card set are: Birds of Paradise, Wrath of God, Ball Lightning, Savannah Lions, Shivan Dragon, and Serra Angel.